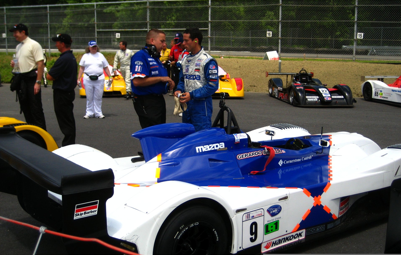 Rounds 5 and 6 of the 2007 IMSA Lites series took place at 10:30 AM and 1:30 PM yesterday, July 7. I heard the online Lime Timing system was a little problematic, so here's the scoop. Thanks to the Pole position, I started at the head of the pack for Round 5. At the green, I could easily lead into turn 1. We filed in orderly, with the second and third place cars battling into the corner. As we made it to the Uphill Turn 5 a couple of laps later, all I could see in my mirrors was one of them in the grass and a huge gap forming. I was in a safe position. Later Jay Cochran spun in the Downhill Turn 7, allowing me to cruise to a victory with a 15 second margin. During that time I had a blast carving through traffic. The drivers in slower cars did a fine job of staying on the racing line, allowing the faster cars to choose their passing lines. It was great fun. After the race, we had only two hours to prepare for Round 6. 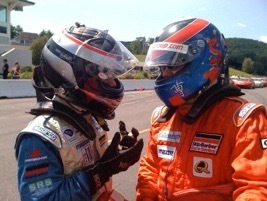 My B-K Motorsports guys, Thomas Unger and Steve Levinsohn, set upon preparing for another race in about 70 minutes time. Mere mortals need not apply for this duty. These guys simply did an amazing job preparing my car. But there were other preparation challenges. For some bizarre reason, my right forearm cramped up tightly. I was a little worried about surviving the second race. Help was close at hand. 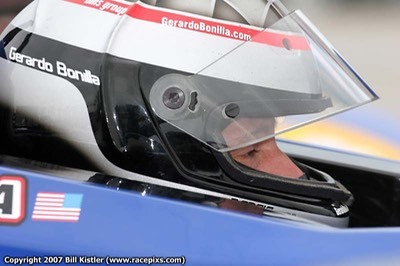 My most trusted coach and mentor, Christian Boudon, was just a few trailers down the paddock helping Formula BMW up and coming star Philip Major with his races. Christian was kind enough to advise me on how to care for my forearm and eat just the right foods and fluids before the next race. Because of his generosity, I was even more relaxed for Round 6. I was ready for another battle. I had to start Round 6 in second place as Jay Cochran had run a lap time just a tenth faster during Round 5, and those are the times IMSA Lites uses to grid for the second race. As we took the green, Jay and I were side by side into Turn 1. I've done the outside pass before, so why not today? Jay was very late on the brake, but I turned in anyway. We banged wheels and I smiled. This was fun! Jay got ahead after the banging and I slotted in behind him. We ran together, cat and mouse, for the entire race. He'd get held up in traffic, I'd almost crash into his rear bumper, then we'd separate. We were never more than about a second apart until the final laps. One last car to be lapped held us up a little more than the others, separating Jay and I by three seconds, where we would finish. He drove a great race. I drove with the bigger picture in mind. I knew we'd be in great shape in the points by finishing second. Going fast enough to win this single race would have required a big increase in risk. With a win and a P2, we now sit 30 points ahead of the next driver in the overall points. A great weekend by any standard. Perhaps the best part of the weekend was having Michelle and Murray Marden, Pat Daly, Leland Englebardt, and many others from the world of Skip Barber stop by to visit. Mechanics, instructors, senior managers, you name it, all the guys who lived close by were on hand. It made the weekend so much more fun to have friends close by. Many thanks to Thomas Unger and Steve Levinsohn for treating me like a rock star. Thanks to Bob Bach and the entire B-K Motorsports organization for assembling a top caliber IMSA Lites team for me to race with. Thanks to Skip Barber, Cornerstone Controls, and all the other sponsors and donors who have helped me build this business into something special. Thanks to Auriemma Consulting Group/Marcus Motorsports and Autosport Development for the recent test days. And thanks again to Christian Boudon. Your mentoring and friendship is one of the greatest gifts I have received. Our next races are on August 25-26 at Canada's Mosport International Raceway. I hope to see you there! It was a long but fun day at Lime Rock Park today. 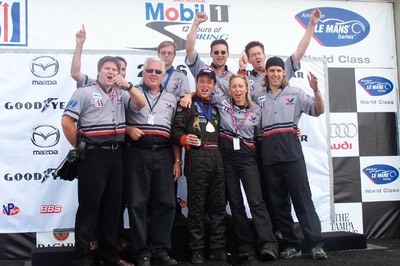 The IMSA Lites Series presented by Hankook began its third race weekend for rounds 5 and 6 of the 2007 championship. Leading up to this weekend was a series of really dynamic experiences. I had been hired to test a Pontiac GTO by Autosport Development, a team in the SPEED World Challenge Series. Following that test I was at Cleveland coaching the Skip Barber National drivers. That was a great experience, watching both races with 30 cars go green flag from start to finish. I then found myself at Road America teaching the Computer Car for a large group of drivers in the Skip Barber Regional series. From there I was at Lime Rock to do a shakedown on a new IMSA Lites car this past Wednesday. 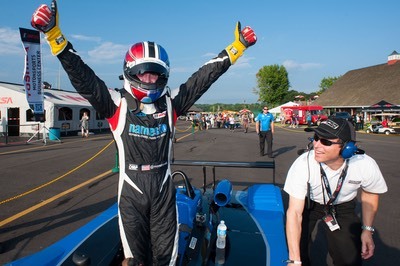 I hopped in a street car immediately after, driven by my professional chauffeur Pat Daly, and did a 5-hour trek to Watkins Glen, where on Thursday I tested a Porsche 911 Koni Challenge car for Auriemma Consulting Group and Marcus Motorsports. 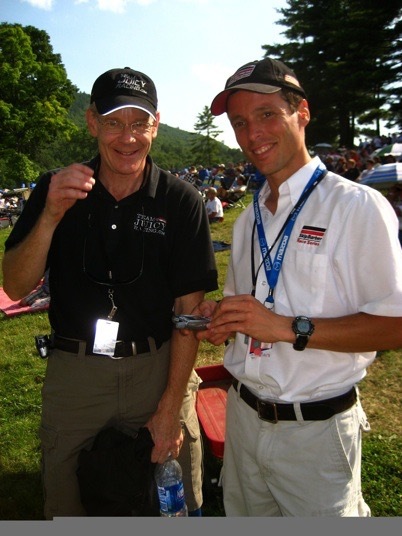 My good friend Pat Daly then immediately drove me back to Lime Rock, getting in just before midnight Thursday night, to get up this morning and head to the track for Practice 1, 2, and Qualifying. Busy! What an amazing month its been. We got right to it. It was my first time in a car this fast at Lime Rock. Sure, I've done a few laps in Skip Barber cars, but when you carry even bigger speed at a track for the first time, it always takes a little getting used to. 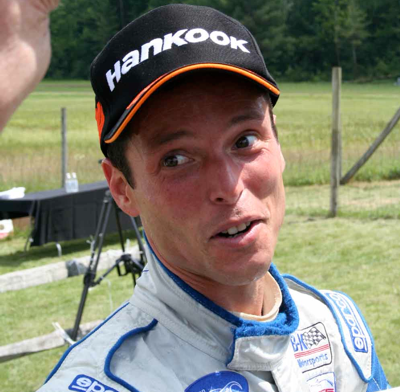 In Practice 1 I settled into second fastest time by a tenth of a second behind longtime prototype veteran Jay Cochran. "There's a ton left in this car," I told my lead mechanic and team manager, Thomas Unger and Steve Levinsohn. We had faith things would improve for us. In the second practice the skies were dark, but it was still dry at the start. I went immediately for a time. I found a 50.957 lap somewhere in there, enough for P1 by 1.4 seconds. Half way into the session, it began to rain. I immediately jumped in the pits and asked for rain tires. There was a chance for rain in qualifying, so we had to get some wet laps. I went out in a downpour only to find myself a bit lonely. No one else went out in the rain. Are they nuts!!?? I did three laps before they red flagged the session due to lightning. But those three laps were a priceless education on this car in the wet here. We qualified at 4:55 PM. Sure enough, it began to rain lightly just before qualifying was to begin. What would we do? Rain tires or slicks? The track still had some heat in it from the last few hours of sun, and water had not yet coated the track. We would stay on slicks expecting the track to dry. Those first few laps were pretty wild and crazy! 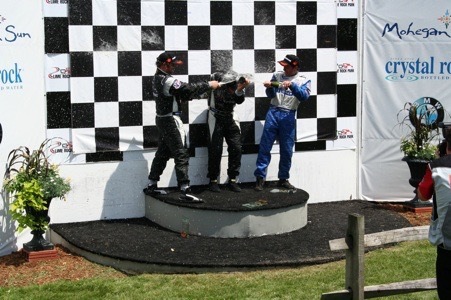 The car was slipping and sliding all over, but boy, did it bring back some great memories from Skip Barber races here. It was just so much fun to study the track, watch it dry, take a little risk here and there to find more speed. The other major challenge was traffic. Lots of drivers played it very safe, which meant catching them rather frequently. Literally every lap but three I had to pass cars carefully. But, by some miracle, I found a big hole, enough for a single lap, just as the checker was about to wave. I found pole position by a gap of about 1.8 seconds. Holy crap. This was pretty special. That lap felt so good. The car was just so nice to drive thanks to Tom and Steve. Mike Marino had a hand in it as well, thanks to his providing us an in-car camera. Michelle and Murray Marden stopped by to give me some cheers. What great friends. Pat Daly also hung with us most of the day, proving I had not bored him too greatly during our long drives to and from Watkins Glen. His help was the key to my week. Many others with ties to Skip Barber stopped by. Thanks guys, it's always nice to have friends in for a visit. Even most of our Skip Barber senior management was present, spreading the good word for us and for our partner Mazda. It's a dream out here. 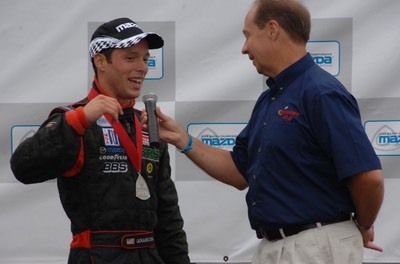 I can't wait to share what I've learned with many of you at Skip Barber. We will race twice tomorrow. Race 1 is at 10:30 AM Eastern while Race 2 is at 1:30 PM Eastern. You can catch them on the internet on Live Timing and Scoring. 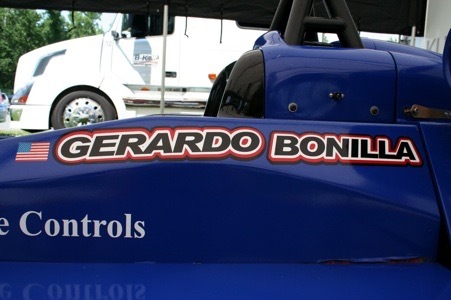 The links can be found at www.imsaracing.net and at www.gerardobonilla.com on the home page.